You may have already noticed that Browseo has been updated a few days ago. First, we tweaked the performance with the result that Browseo is now more than 2x faster than before. The delay between entering a URL and looking at the results is now barely visible in some cases. This should be of interest to our power users, who browse hundreds of pages over a short period. Many people have asked us about this since the beginning, and I think this should especially be helpful for consultants and webdesigners. 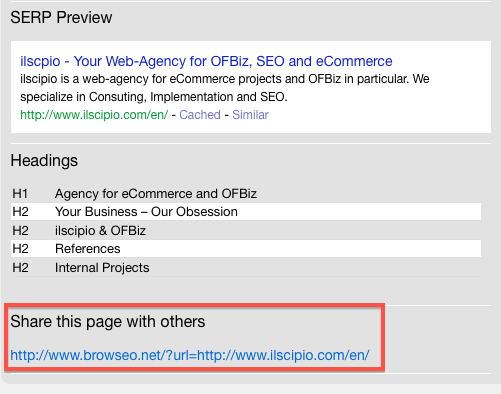 You can now send your client a direct link to show them what their site may look like to search engines. More features are in the making. If you have any requests or specific feature suggestions please feel free to contact us. If you include text below the copyright notice in your footer you're probably doing it wrong. The reason why I see this so often on ecommerce sites may be that for those types of sites it can be especially challenging to write compelling copy to attract visitors. How do you come up with meaningful text for, say, category pages? Unfortunately, some folks fall for the wrong answer and that's why we have to look at ugly footers on a daily basis. I mean, the obvious answer would be to describe the content of the particular page in a unique and meaningful way. The terms "add value" and "unique content" seem to often be taken in the wrong way by people though, to the extent that their meaning is completely detached from reality. Instead of adding value for their visitors, which will then automatically be recognized by search engines, they try to add value exclusively for search engines. And that always means trouble. Another common mistake we see people make is what David Harry described as "The other guy is doing it, so it must work". People come up with all kinds of crazy tactics, so while it is of course necessary to know what is going on in your particular query space and what competitors are up to, more often than not blindly copying other people's strategy does more harm than good. There are basic best practices that have emerged out of actual experience of people inside the SEO industry over many years, and these are usually the very same tactics search engines themselves recommend (see Google & Bing). 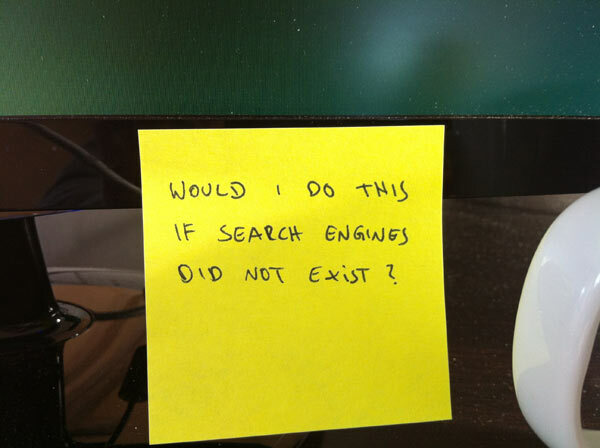 would you do the same thing if search engines did not exist? I think especially question #2 is very helpful and should be stuck onto every SEO's monitor. The footer on a webpage has a very specific purpose. Stick to that and include your copy where it's supposed to go instead: above the fold. Find a way to come up with compelling copy that adds value and everybody wins: users get interesting information to read and search engines are able to give you the traffic you reserve. Also, you won't have to hide your content from your visitors anymore. Makes sense, doesn't it? Since then we've received a lot of emails and tweets with praise, criticism and feature requests. Exactly what we need to make Browseo even better for all of you! We've already received feedback from early testers during the past few weeks - including Debra Mastaler, Dan Thies, Tad Chef, Marcus Tandler and many others. We're currently working on the next release. Meanwhile, check out Dan Shure's review with lots of screenshots here and read what SEO legend Sante J. Achille has to say about Browseo (he even wrote a separate post for his Italian audience). The folks at Inbound.org have been very kind to us too, keeping Browseo on top of the front page for the entire weekend and sending our target audience (you!) right to our site. Rand Fishkin mentioned seo-browser.com, which was of course a great inspiration. Last but not least: please keep the feedback coming. We are striving to create a very solid and functional SEO browser for the entire community, so let us know what you want Browseo to do and we'll look into it! First, let me tell you that whenever you hear someone talk about things like "keyword density", please ignore them. Worrying about keyword density is not going to help you, quite the contrary: stuffing keywords into places where you wouldn't normally use them just doesn't make any sense for your readers or for search engines. What you should do is write naturally and use keywords where it makes sense. I'll write about keyword strategy another time, but right now I suggest that if you have three keywords you would like to position your website for, each of those keywords needs its own page on your website. If creating a unique page for a keyword doesn't make sense, then I would ask myself if that keyword is really the right one to target. If you have a group of keywords that are very similar to each other you can try to target all of them on the same page, but this is not recommended in most cases. The search engines are trying to figure out what their users really want when they search. In order to determine whether or not that page on your website is a candidate for a certain search term, search engines look at the text on the page. If you write for your website visitors you can't really go wrong. Make your copy easy to read by dividing it into short paragraphs and include sub headings every now and then to make it easy for people to scan the page and easily figure out what it is about. Keywords should be used in a page's main heading and in sub headings. I am not asking you to stuff your keyword into every heading on the page. The H1 heading is usually the main heading of a page, and it should include the page's main keyword. If you have variations of that keyword that you want to use on the same page, then sub headings may be the best place. There are a few spots where search engines look for content apart from a page's copy, and those can be found in the <head> section of the page. So even though you want to include your most important keyword for a particular page in its title tag, I suggest writing it in a way that attracts the attention of searchers. Getting ranked is of course important, but you want people to visit your website as a result of your good ranking. Stuffing a bunch of keywords into the title tag won't help. Google will only display a limited amount of characters in their search results, so you want to limit your title tag to around 65 characters including spaces and punctuation. Whether Google displays your page's meta description or not mainly depends on the user's query. While Google may not give the content of the meta description any special weight, it's a great chance to decide what people see in the search results. If a query matches a word you use in the meta description it is highlighted (like Browseo in the screenshot above). Focus on describing the page's content and make people want to click through to your website. Google displays around 150 characters including spaces and punctuation, but be aware that they sometimes display a page's publication date, which limits the amount of characters you can play with. Browseo's main feature is its reduced browsing experience. It allows you to look at any web page's content without distractions caused by styles. There are no settings, just enter a web page address and hit the "Browse" button to get started. The page is then stripped almost naked, except for a few styles that enhance readability. In addition to displaying the page's content, we have added some useful information about the page you are viewing, such as response codes, title tag, meta description as well as details about what headings are used. This gives you a good picture of what search engines see and rate in addition to the text on a page. Nofollow - links that include the rel="nofollow" attribute. Search engines do not follow those links. This attribute is often added to links automatically in order to prevent spam or at least reduce the damage it can do in the comments section on a blog entry, in forums etc. Find out more about rel="nofollow" on Wikipedia.